Western herbalists love to love weeds. We hold up our golden dandelions as if they were a golden chalice and we praise the spread of the humble plantain. Comfrey, clover, and wild mustards are all loved by herbalists. But what about that small purple mint lurking in our lawns with the panacea-like name? Self heal herb, heal-all, slough heal and woundwort are all common names for Prunella vulgaris. 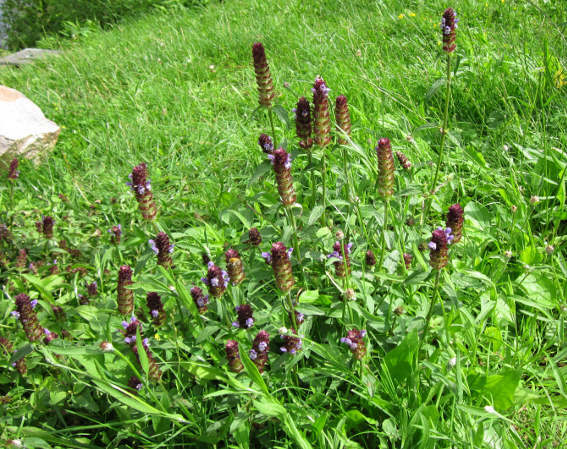 The genus name, Prunella, comes from the German word for quinsy, a severe sore throat caused by a tonsil abscess for which self-heal is said to be a cure. The species name vulgaris, meaning “common,” indicates the plant’s ubiquitous nature. 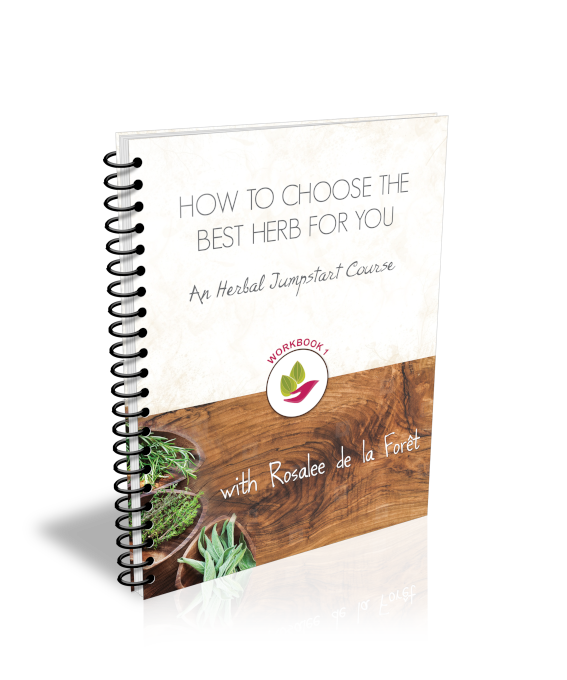 The self heal herb is so common that it is often overlooked. Many herbals referenced for this article had no entries for self-heal. Some acknowledged its use but limited their descriptions to “this herb is not commonly used in Western herbalism”. Meanwhile, scientists have been busy exploring this plant’s powerful uses, from anticancer properties to antiviral capabilities. Self-heal likewise has not been forgotten by Chinese herbalists who refer to it as the “summer-dry herb” and use it for signs of heat and liver constraint. In this article, we’ll look at the many ways this modest plant has been used by herbalists and the findings of scientists who are studying it today. First we’ll look at the energetics and taste. Self-heal is described as a bitter plant. Depending on your source of information you may also see that it can be classified as acrid or slightly pungent. I recommend taking a nibble of fresh self-heal or making your own cup of self-heal tea. You might notice that there is some sweetness there and perhaps the familiar taste of another mint family plant. If we were sitting together I would insist on that cup of tea now, but instead I’ll just ruin the surprise. Self-heal tastes just a bit like rosemary. Self-heal is actually very high in rosmarinic acid, one of the well-studied antioxidants famously found in rosemary. Self-heal, like many mint family plants, is both cooling and diffusive. It also has significant mucilage, making it a nice demulcent. 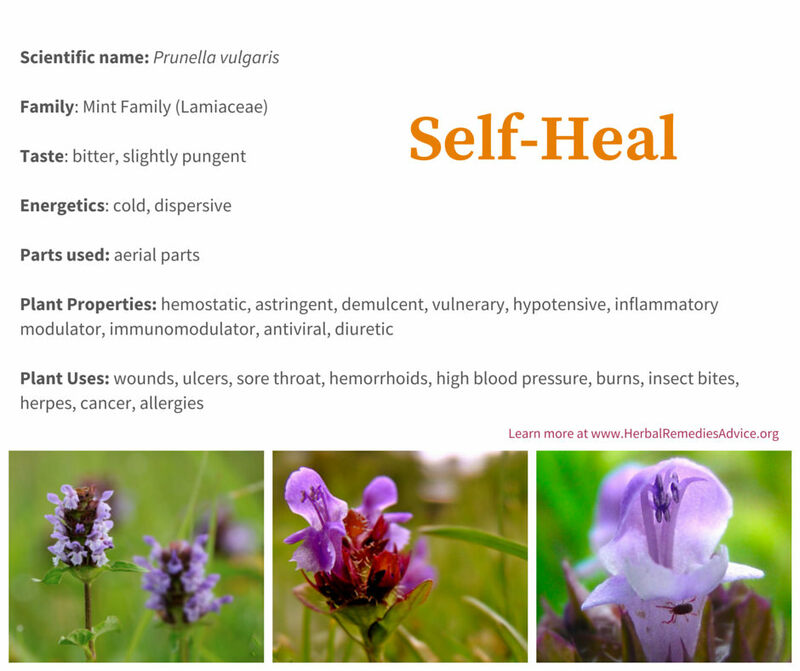 In Western herbalism, self-heal has been commonly used for all sorts of wounds. Some herbalists liken its qualities to plantain’s vulnerary abilities. Both of these plants are somewhat astringent and demulcent, stabilizing tissue and protecting the skin’s moisture at the same time. 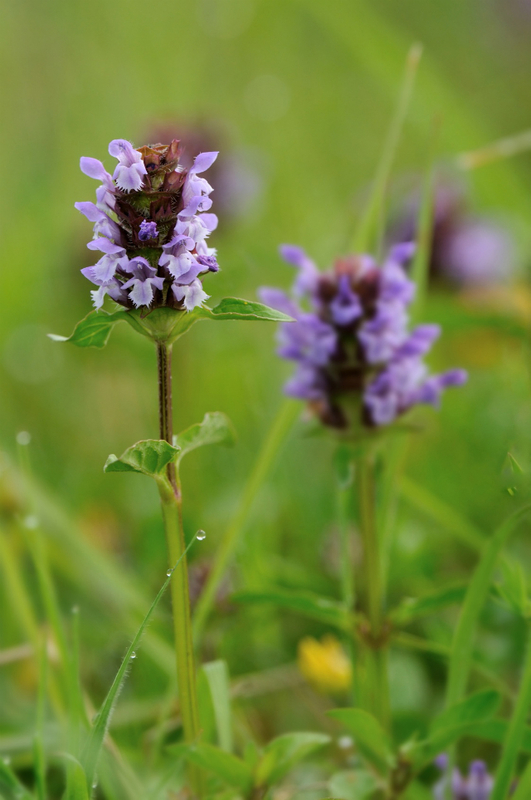 Self-heal is used for wounds on the skin, including cuts, scrapes and burns. It’s also used for drawing out infections, such as abscesses and boils. 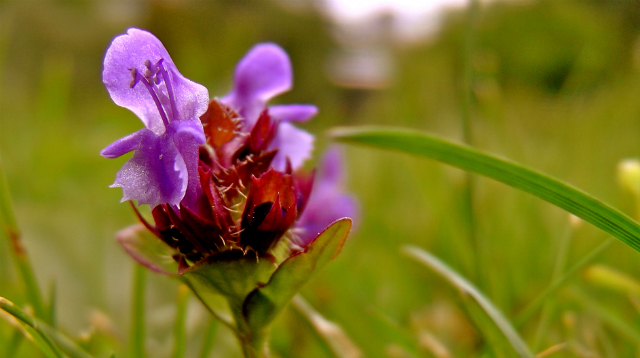 Internally, self-heal has been used for ulcers, especially those in the mouth and throat. Numerous herbalists claim that self-heal is a styptic herb that can staunch the flow of bleeding similar to yarrow or shepherd’s purse. 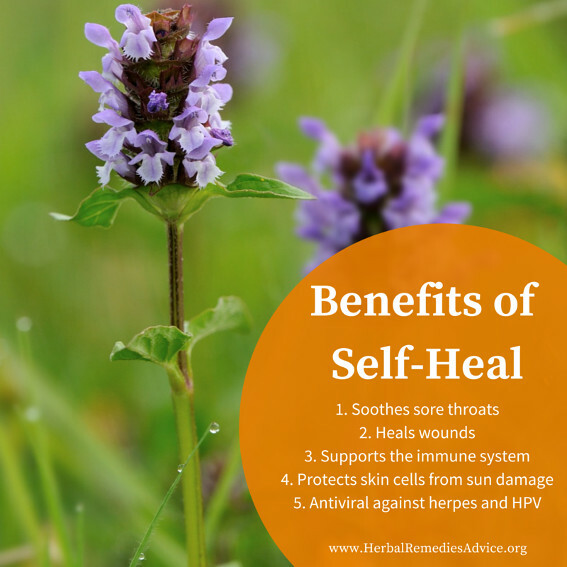 A plethora of studies have shown that self-heal has antiviral properties, especially against the herpes simplex virus, HPV and even HIV. Researchers have shown that it inhibits the binding ability of a virus, making it most effective at preventing and stopping new outbreaks. Because it inhibits the ability of viruses to replicate, it is most effective at stopping recurring localized viral infections such as herpes. Some interesting in-vitro studies have been done using self-heal against HIV, showing that is has the ability to inhibit viral replication in a petri dish. Researchers on these studies are optimistic about their findings and have encouraged more testing to be done. Remember that slightly sweet taste we detected in our cup of self-heal tea? It turns out self-heal has polysaccharides (like astragalus and many mushrooms), which are known to be balancing to the immune system, or immunomodulating. Taken regularly, self-heal may support a healthy immune system and reduce the incidence of upper respiratory infections. 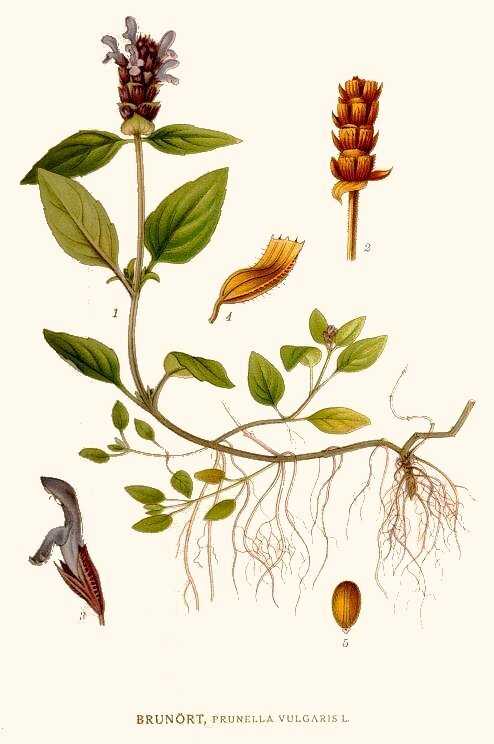 Self-heal was historically used for sore throats, even severe ones like quinsy, which is an abscess of the tonsils. It is a great choice as a hot tea at the beginning stages of a cold with sore throat. In addition to fighting the virus, the demulcent qualities of self-heal will help to soothe and coat a dry, scratchy or irritated throat. against all inflammations of the privates in both men and women. Those who do not have the distilled water of self heal, or cannot get it, just use the freshly squeezed juice during the summer, or in the winter boil the dried leaves in water and use this instead. As part of its immunomodulating action, self-heal reduces an excessive immune system response like what we see with seasonal allergies or chronic inflammation. 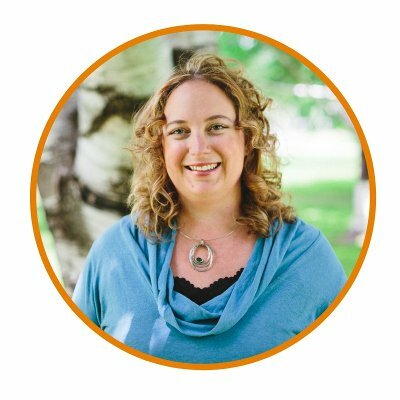 Of course, when dealing with chronic inflammation we always want to address the root cause, which is often based on diet or lifestyle. However, regularly drinking self-heal tea may help reduce your seasonal allergy symptoms. Herbalist William LeSassier praised self-heal for its kidney-strengthening abilities. 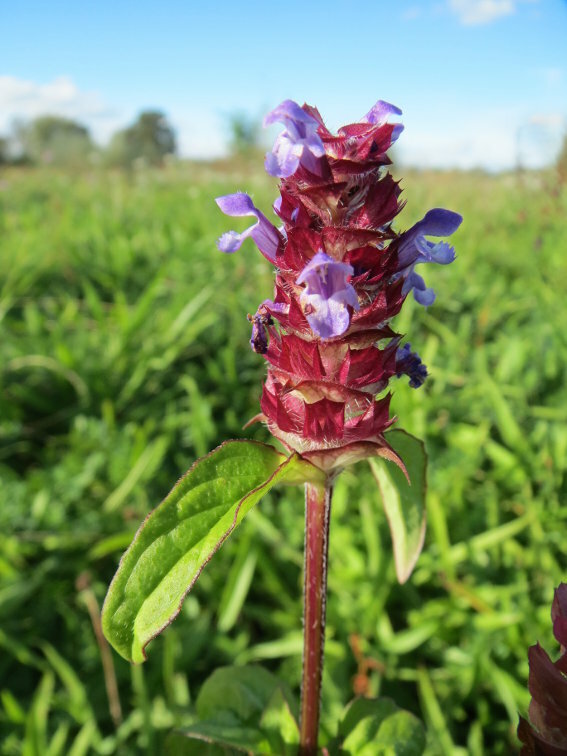 In The Earthwise Herbal, Matthew Wood relates that LeSassier specifically thought of self-heal when there was deficient kidney function along with dental decay. In addition to strengthening the kidneys, self-heal is a mild diuretic that could be helpful for draining dampness, such as edema, or a way to reduce high blood pressure. Self-heal has been shown to increase insulin sensitivity, thus preventing or reducing the effects of metabolic syndrome and diabetes. Most heart disease in the US is a symptom of this increasingly common metabolic syndrome, a chronic disease that manifests as poor glucose metabolism that creates a systemic inflammatory condition. Besides increasing insulin sensitivity, self-heal may also have beneficial effects on the cardiovascular system. It is used to lower blood pressure in Chinese medicine and has been shown to have inflammatory-modulating effects on cardiovascular tissues. Chinese medicine specifically uses self-heal for signs of “Liver fire rising” and “Liver constraint.” Headaches and painful eyes that are worse at night are indications for self-heal. Self-heal is recommended for many types of eye complaints, including red eyes, conjunctivitis and eye-tearing. The third edition of the Chinese Herbal Medicine Materia Medica (Bensky and Gamble) recommends the dew or hydrosol of self-heal as a tonic for preventing and treating summer heat and summer rashes in both children and adults. Self-heal cools the body and disperses heat. The mild demulcent qualities may help to rehydrate as well. Self-heal and its constituent rosmarinic acid have been shown to protect skin cells from UVA and UVB radiation. In one study, researchers looked at self-heal as an herbal photo-protectant and concluded that self-heal may offer protection against the sun when used in dermatological products. While we are waiting for in-vivo tests to substantiate these findings, self-heal infused oils would be a nice addition to anyone’s skin regimen. That’s right, this weed commonly found in lawns everywhere has been shown to have anticancer effects, especially against lung cancer and lymphoma. Most of the studies to date are in-vitro so more research is needed, but the sheer volume of positive studies highlights self-heal’s anticancer potential. Another mechanism that self-heal has been shown to possess is an anti-estrogenic quality. Researchers surmise that it could be used to prevent or stop estrogen-dependent tumors. Self-heal has also long been used for stagnant lymph nodes and non-serious nodules. It is taken both internally and used externally as a fresh poultice to get lymph moving. Self-heal can be used in a lot of different preparations. Self-heal tastes slightly bitter and slightly sweet with a hint of rosemary. You can enjoy eating the leaves and flowers in a salad blend or as a trail snack. It makes a great tea and can also be extracted into alcohol or infused into oil for making a salve. Tea: 1-2 tsp of the dried herb, 8 oz hot water. Steep 1 hour. Take two to three cups per day. The Chinese Herbal Medicine Materia Medica recommends self-heal in dosages as high as 180 grams per day (roughly 6 ounces). It’s hard to take too much of self-heal! Self-heal has also been used externally as a wash or fomentation and has been used as a vaginal douche or suppository. Self-heal is a mild plant with no known toxicity, making it safe for most people. It has some possibility of interfering with blood thinners. The Chinese Herbal Medicine Materia Medica says that it could harm someone who already has weak digestion if taken in large amounts over time. 1. The purple flowers have a lipped-shape appearance and grow on spikes. 2. The leaves are opposite each other on the stem. 3. The stems are square. The flowers are purple with a lipped-shape appearance. Herbalists who discuss the Doctrine of Signatures might point out that the flowers look like a mouth and throat pointing towards its use for sore throats. The plant grows close to the ground, up to one foot in height. It loves damp shady places and often grows in lawns. It will also grow in full sun. It grows all over the globe and readily spreads once established. Self-heal grows abundantly as a weed and loves to be harvested. Beloved herbalist Cascade Anderson Geller recommends frequently harvesting the flower heads to inspire further blooming. 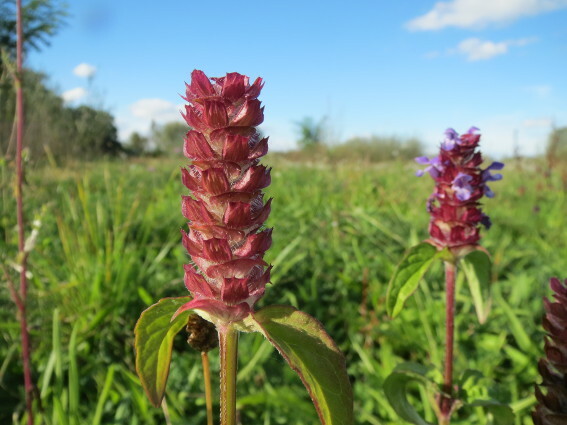 Researchers have studied the chemical composition of self-heal gathered at different times of the year and concluded that it has a higher biochemical value when harvested earlier in the year. They have also studied how storage time effects dried self-heal and recommend that one should use self-heal within a year of drying for best results. While not commonly used by many Western herbalists today, self-heal (Prunella vulgaris) has a long history of use for healing wounds, both inside and outside the body, as well as for moving lymph and soothing sore throats. Numerous studies have been done on self-heal, showing promise for using it against cancer, to support a healthy immune system, to protect the skin from sun damage, and to address inflammation like that associated with diabetes and heart disease. 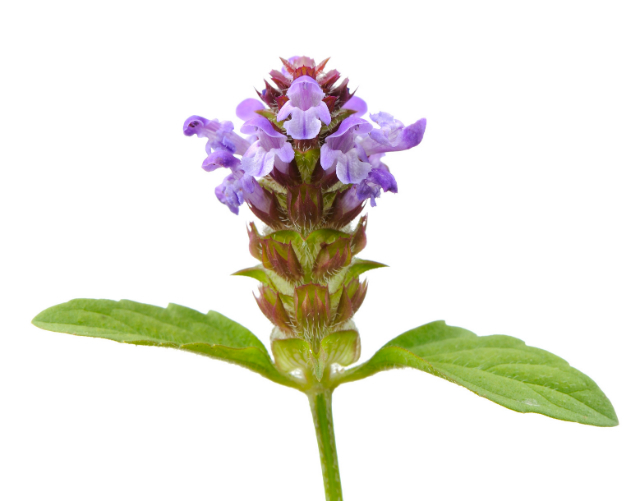 While more clinical tests are warranted before we make any strong claims about self-heal in practice, don’t hesitate to use this safe food-herb in the meantime. Head out to your lawn and harvest these beautiful weeds. Make a tea, infuse some into oil, extract some in alcohol, and come back here to share your self-heal experiences with us in the comments section below. She’ll bathe and bind, and soon she’ll find, that they are well again. Int J Mol Med. 2005 Dec;16(6):1109-16. Immune modulatory effects of Prunella vulgaris L. on monocytes/macrophages. Antiviral Res. 1999 Nov;44(1):43-54.Isolation and characterization of an anti-HSV polysaccharide from Prunella vulgaris. Int J Mol Med. 2005 Mar;15(3):491-6. Immune modulatory effects of Prunella vulgaris L.
Arch Dermatol Res. 2010 Apr;302(3):171-81. doi: 10.1007/s00403-009-0999-6. Epub 2009 Oct 28. Prunella vulgaris extract and rosmarinic acid prevent UVB-induced DNA damage and oxidative stress in HaCaT keratinocytes. Virol J. 2011 Apr 23;8:188. doi: 10.1186/1743-422X-8-188. Inhibition of HIV-1 infection by aqueous extracts of Prunella vulgaris L.
Int J Biol Macromol. 2015 Jan 13;75C:298-305. doi: 10.1016/j.ijbiomac.2015.01.010. [Epub ahead of print] Characterization, antioxidant and immunomodulatory activities of polysaccharides from Prunella vulgaris Linn.